Rhizomatic Studio encourages the cultivation of artistic relationships while engaging dialogue across discipline and aesthetic. As an interdisciplinary community of peers, artists working in different performance disciplines support one another to make the best work possible. At each 3-hour session, the artists present up to 10-minutes of material for feedback from the group, using Liz Lerman's Critical Response Process which guides the artists toward providing valuable perspective on the work presented, without “directing." I love this method because it allows us to very quickly establish a safe space for highly specific and generative feedback. Unlike some critique experiences, this method gives the artist ultimate agency and authority over their work. It can be hard to get used to at first (as the structure is quite specific), but ultimately it reveals a lot about our own aesthetics and biases, and makes us better listeners and watchers. Presented January-February 2017 by the Hammer Museum with artists HEISUE CHUNG-MATHEU & GRACE HWANG, KAI HAZELWOOD & SAM DE LEVE, SARAH BELLE REID, SHAINA LYNN SIMMONS, JUAN CARLOS ZALDIVAR, TIM TSANG. Contact me about booking this workshop as a 4-hour intensive or 90-minute segments. Do you get tongue tied in networking situations? Get writers block writing about yourself for grants? Think these tasks would go down easier with a partner and a glass of something bubbly? In this fun (and practical) workshop for artists and creative professionals, we practice talking about what we do, why we do it, and why it matters. Using structured, one on one interviews, you will learn to craft clear and meaningful elevator pitches, mission statements, and personal statements that express your unique identity for grants, publicity, and publication. We'll make meaningful connections with peers from across diverse artistic communities over 4-hours of deep-dive into what motivates us to make our work. Collective Creation Lab is a practice-based studio workshop for performers of all disciplines to try out new ideas and ways of working. Participants take turns leading structures for generating new material, and playing with old, new, or undeveloped ideas, in a safe, supportive, interdisciplinary cohort of peers. The goal is not to create "a piece,” or even show anything we make to the public. The Lab is a place to play around, try out ideas, experiment with ways of working that are totally outside your wheel house, make BAD WORK in a fun, safe, private space, etc. YOU tell us what you want to experiment with, make a lesson plan, and we'll dive in together. Presented by Pieter Performance Space in 2015 and 2016. In this workshop we play with the relationship between performer and audience (witness, participant, co-performer, guest...), and experiment with creating space, through live encounter, for empathy and intimacy (whatever that means to you). Individually and in collaboration, students will practice making participatory interdisciplinary work in intimate settings, and create spaces for intimacy within public settings. At the end of each day, we will discuss and practice exercises for energetic restoration and repair ("sealing" or closing the day), to help support a healthy and sustainable long-term practice. If you are exploring vulnerability or participation in your work; if you're working in public or private spaces, or performing for very small audiences; if open-ended scores that rely on the viewer to complete them tickle your fancy; or if you want to learn about one-to-one performance as a genre, this is the workshop for you. 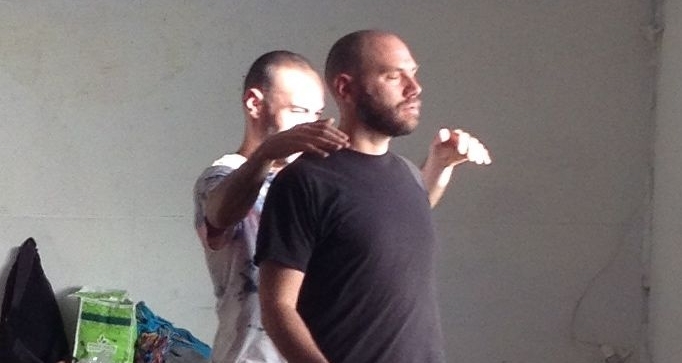 This workshop explores the politics of "witnessing" in intimate, participatory performances, wth an emphasis on ethics and agency in the performer-spectator dynamic. We will investigate and experiment with one-on-one performance in which the viewer is configured as witness or accomplice. Working in pairs, we experiment with opening and closing the "social aperture" of seeing and being seen (the extreme limits of which might be surveillance vs. lap dances). How do we configure micro-audiences in relation to performing bodies? What do we ask of the viewer? How do we elicit participation while negotiating social contracts of mutual dependence? For artists interested in working across distances and borders both literal and conceptual; artists collaborating across discipline or cultural affiliation; online border-crossers who envision new creative uses for the transnational highways of the “world wide web” that prioritize dialogue, encounter, and embodiment. 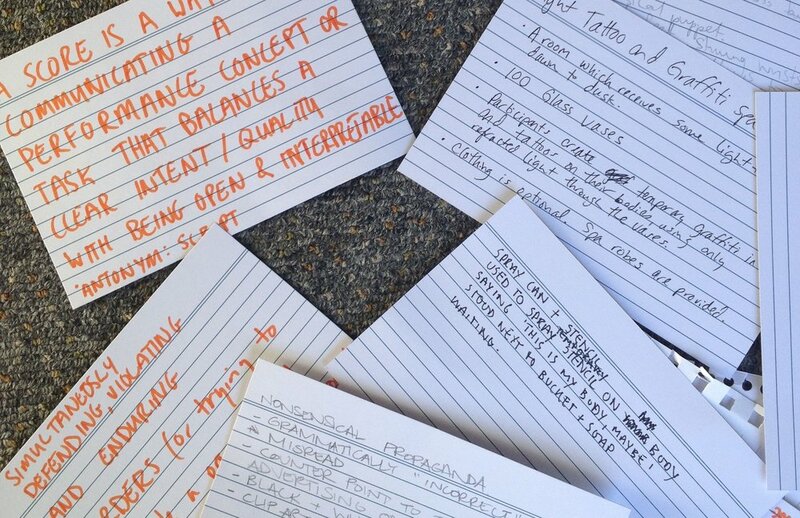 This workshop presents one collaboration structure to explore how we might apply open source principles to collaborative interdisciplinary performance, so that we maintain an equitable balance of authorship as we co-create, present and distribute content. In the spirit of the commons, we will experiment with offering up our existing material, archive, or repertoire for elaboration, (de-/re-)construction, and germination of new works by others. Suitable for artists working in and across the mediums of performance/live art, theater, dance, music, street art, installation, photography, film, video and new media. Developed in collaboration with Sam Fox and Terrance Houle, this workshop was presented in 2014 at the Center for Interdisciplinary Arts Studios (Perth, Australia) and Contemporary Calgary (Canada). Contact me to book a workshop.